Hahaha that came out a bit too jollly. Just trying to brighten up the day despite the storm Glenda hovering nearby. Doesn't look like much now but I think we still need to be cautious and stay indoors as much as possible to avoid the possibility of becoming a liability in case things turn serious towards the end of the day. Anyway...this is what I wore to the Watsons Bath to Basics event a few days ago. It was a spa thing so I opted to keep things simple and laidback. We were asked to go in "Watsons colors": white,green or beige so I thought it was the perfect opportunity to wear this tropical-flamingo print set which I got from Chase for only P600 during our visit to Fairview Terraces (read about it here) a couple of weeks ago. Added a pink furry scrunchy for a fun and unpredictable touch.. 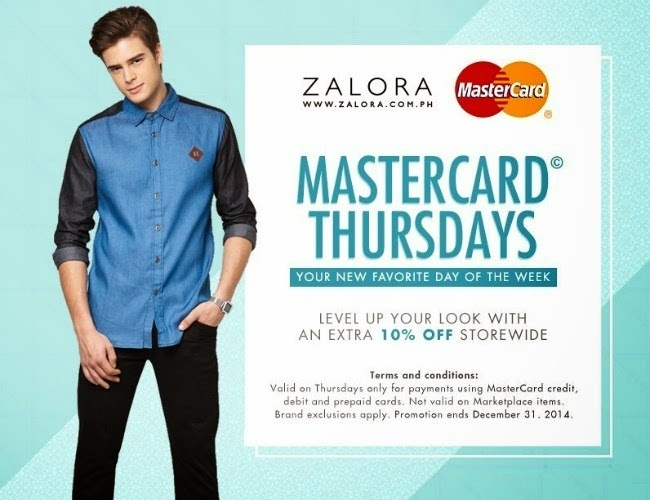 Speaking of fashion, have you heard about Trendy Thursdays with Zalora and MasterCard??? Basically, shopping on Zalora every Thursday gives you an automatic 10% off when you pay with MasterCard! There is no minimum spend and the promo will run 'til December 31, 2014. Sooo nice, most suitable for summer, I like the pattern.